Back in 1976, Alberta had the good idea of establishing a “Heritage Fund” to accumulate some oil wealth into a fund to benefit Albertans (and Canada) to save for the future, to diversify the economy (away from fossil fuels) and to improve the quality of life for residents. 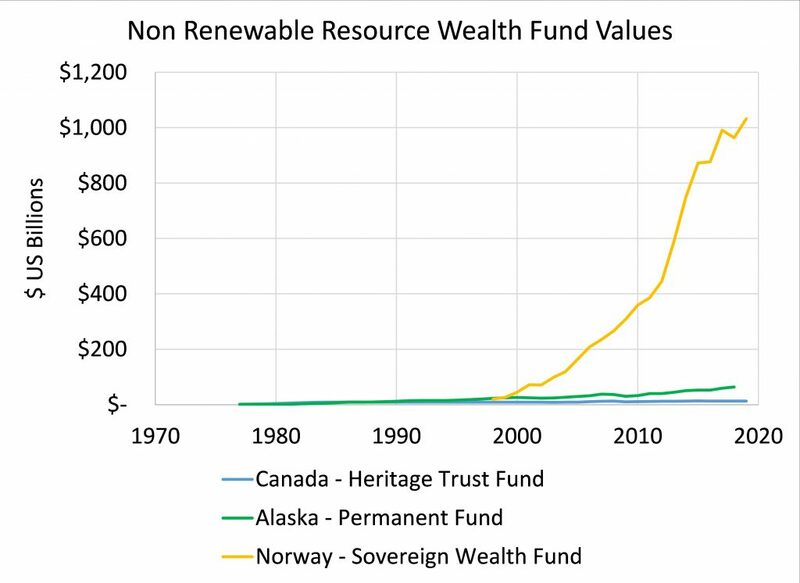 At about the same time, Alaska established its Permanent Fund and around 15 years later, Norway established its Sovereign Wealth Fund with similar goals. Let’s compare the growth of these funds (Fig. 1). The values in Fig. 1 are not adjusted for inflation. If I adjusted the figures for inflation then it would appear that the Canadian Fund is losing real value and that they should just throw in the towel. Reading the annual reports for the Heritage Funds it becomes obvious that Canadian governments did not have the discipline necessary to achieve the fund’s objectives and then through constant changes in policies, raided the fund for pet projects. Why does this matter? Because Norway now has ample financial resources to pay for a transition to a fully renewable energy economy and to diversity its economy away from hydrocarbon production. Canada has no similar fiscal resource to accomplish such lofty objectives in the time frame espoused by its politicians. In the prior blog, I noted that the Prime Minister praised the good fortune of having 173 billion barrels of oil sands resources. However, just two months before that speech in Houston the same Prime Minister gave a speech in Ontario in which he argued that it is necessary for Canada to divest itself from oil sands. The net result is that Canada, and Alberta in particular, is going into the age of oil retirement without any pension or any real plan to live out the post oil age comfortably. In effect for the whole last year, producing and selling Canadian oil has a zero sum game, most likely a negative undertaking, because in Fig. 2, I only use the lowest production costs and lowest transport costs. If Canada can’t find markets and continues to sell oil at a discount, especially if that discount results in producing oil at cost or even below cost, then instead of having $800,000 per capita in the bank (less production costs) Canadians will now have $0 in the bank. Carbon taxes won’t kill Canadian oil production, lack of access to markets will. Aside: Online searches will also bring about loads of stories about how toxic Canada’s oil is. Newsflash, all oil is toxic. Comparing again to Norway, both Norway and Canada have some of the strictest environmental, health and safety standards for oil production. Whereas other less open and democratic states focus on maximizing production without giving a care about environmental or safety issues. So really, where should environmentalists focus their protests, in Canada or in Venezuela? Without pipelines to transfer oil to ports to access world markets, Canada will be very dependent upon the U.S. to buy its oil using existing pipelines and existing rail services. American refiners along the Gulf Coast have been happy to buy cheap Canadian oil to blend for products, especially in the wake of oil production failures in Venezuela, but now comes another scary part for Canada. American refiners may find other suppliers, or worse yet, if Venezuela falls, then the new regime in Venezuela will be quick to ramp up production. The best market for heavy oil is the U.S. Gulf Coast refiners who can use either Canadian heavy crude or Venezuelan heavy crude in their production. There are pipeline constraints and protesters along the route from Canada to the U.S. refiners, but there are no such blockages on the sea between Venezuela and the Gulf of Mexico. Furthermore, transporting crude by rail from Canada to the U.S. Gulf Coast can cost from $10 to $15 per barrel. Shipping a barrel of crude from Venezuela by tanker costs around $2. A big impediment to developing more hydropower in Canada is the poor relationship that the Federal Government has with indigenous nations. There are other reasons, but this one is important enough to address specifically and I’ll give a small, true story, which local folks will be happy to discuss if you ask. On Vancouver Island the village of Tahsis is located within the Mowachaht/Muchalaht First Nation area. There is hydropower potential in the area and a few years back a power developer started to develop a Run of the River hydro plant. Run of the River hydro is supposed to be the least environmentally altering means of producing power. However, the firm working on the project decided that it would be necessary to alter the river run and without consulting anyone started dynamiting the river which then affected fish stocks. (The engineering firm was from the U.S. working for a Canadian developer.) That type of blast first approach to development is horrible but unfortunately characteristic of a lot of large Canadian projects. Fortunately, in Tahsis the First Nations managed to stop the project (and, if I had been there at the time, I would also have jumped all over the dumb-dumb engineering firm and developer for such an approach). 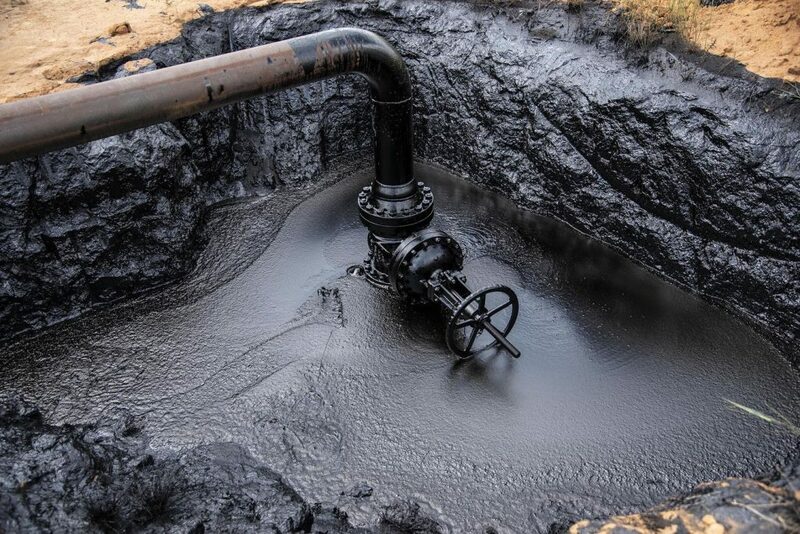 Houston is the oil and gas capital of the world, and had tempestuous beginnings, but we’ve long since learned that it’s not prudent nor necessary to throw one’s weight around by dynamiting things or running rough shod over environments and indigenous residents. There are better ways. The first commercial wind farm in Canada was located in Alberta and became operational in 1993. Since then all provinces have been adding windfarms, with most capacity additions coming on line between 2010 and now. But let’s focus on Alberta and Ontario. Fig 4 compares historical electricity prices for those two provinces. In 2013 Alberta added its largest windfarm to date, about 150 MW capacity. Ontario, since then has been adding a lot more wind, as seen in Fig. 5. What was going on in Ontario? 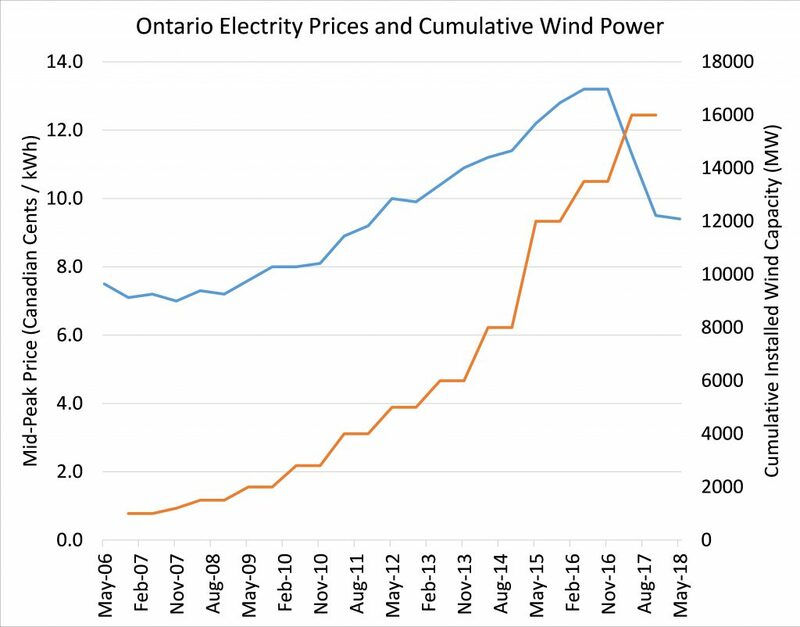 It seemed that the more wind power that Ontario added, the higher its electricity prices went. “Correlation is not Causation”, correct. But in this case, Fig. 5 actually show a causation-effect graph. It’s true, because in Ontario, the Liberal government mismanaged implementation of wind energy (and other renewable energy) which consequently drove up electricity prices. 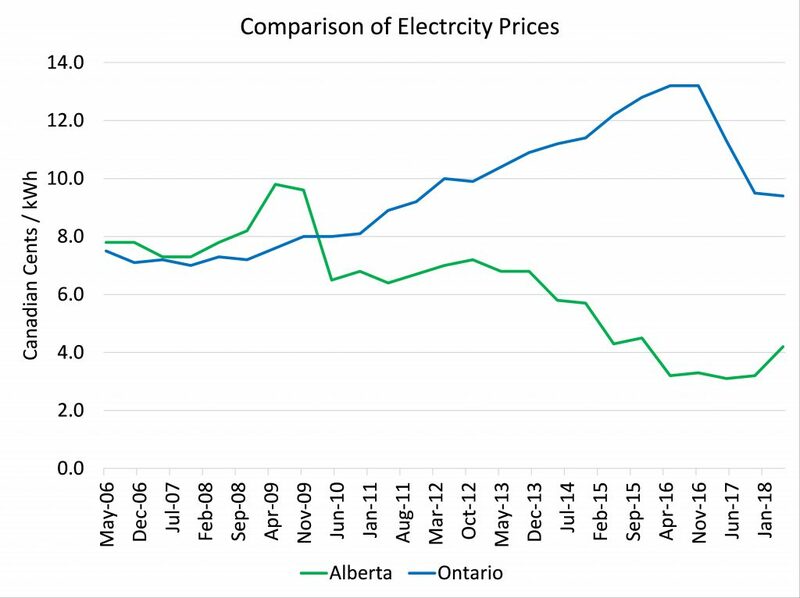 During the same time, in Alberta, they got it right, with electricity prices falling. V. Invest in Energy, Just not in Canada? 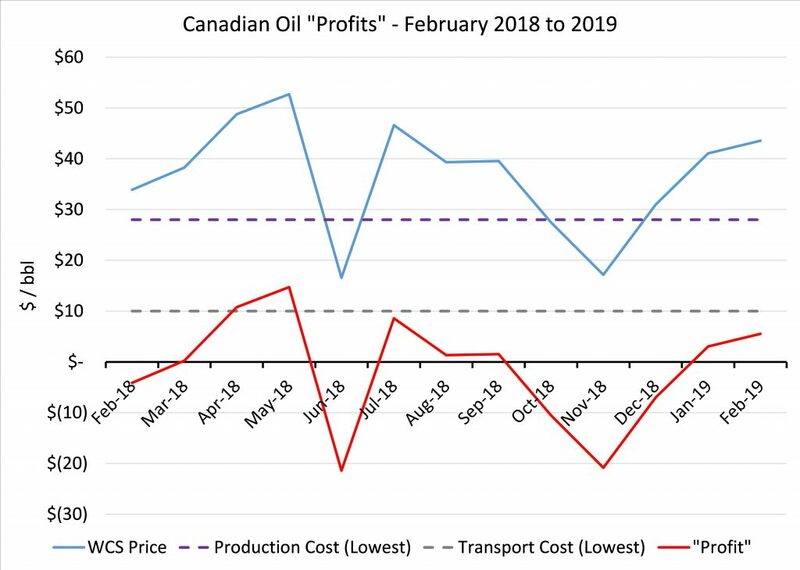 As we’ve seen, even if one can produce heavy oil in Canada and get it to market, it’s likely that one will lose money. Instead of working on ways to improve the oil business in Canada, governments seem hell bent on destroying it even more by applying carbon taxes and implementing other insanities. Diversification into plastics is, in my opinion, a dubious long term solution as the plastics industry faces pressure to reduce output as the world moves towards using less plastic (see prior blog) or using bio-plastics materials that are degradable. Politicians in Canada at times get their priorities by looking backwards and working accordingly. The situation with natural gas is almost as convoluted as with Canadian oil. There are bottlenecks to export. And unlike oil demand, which is forecast to fall soon enough, gas demand will remain strong for some decades. Hydropower could be brought on line if, and it’s a big if, the Federal Canadian government and its preferred contractor would stop patronizing indigenous nations as charities and instead treat them with dignity and respect and as equals. The experience of wind power in Ontario has damaged the case for wind power in Canada and elsewhere. But if people could look past the government mismanagement in Ontario and instead to the successes in Alberta and Texas, Canada could then benefit from cheap, renewable power. But these are a lot of “ifs” and Canada will have to get past the ugly in order to thrive again. It’s a choice between lower taxes, cleaner energy for all, and allowing initiative and ingenuity, or the government taking a share in home ownership, mandating speech, and dictating economics.